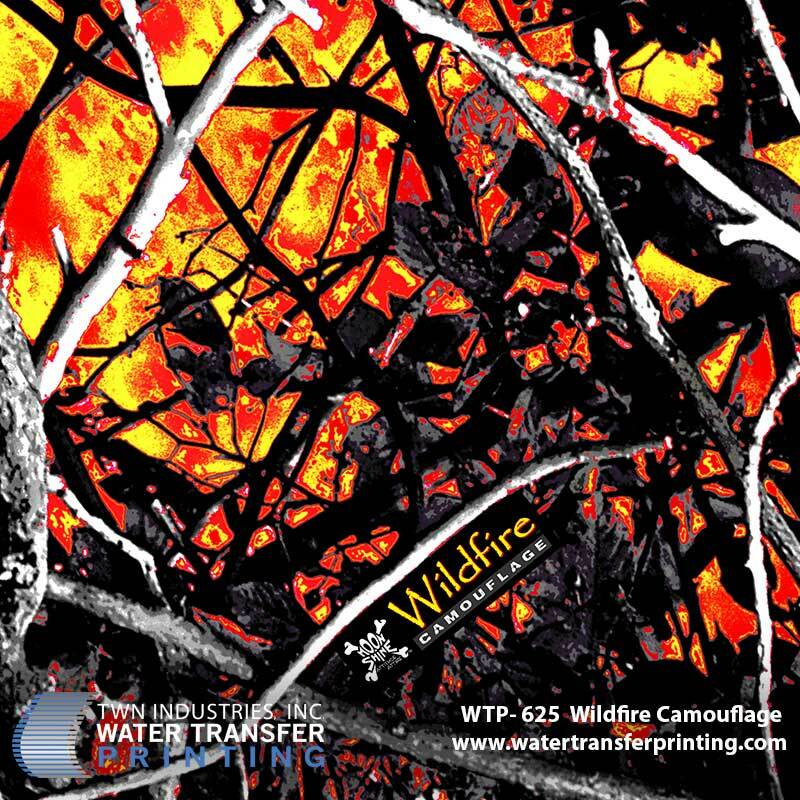 PRINCETON, FL – July 17, 2012 – TWN Industries Inc., the leading Water Transfer Printing supplier, announces the release of Wildfire Camouflage™ water transfer printing film. This is the latest pattern created by Moon Shine Attitude Attire™, a premier designer brand of casual wear for outdoorsmen and women. Water transfer printing (also known as hydrographics and camo dipping) makes over gun stocks, bows, and ATVs by applying graphic patterns like Wildfire Camouflage to hard three dimensional surfaces. Process can be used to decorate almost any product made of metal, plastic, or wood. Wildfire Camouflage was designed by Moon Shine Attitude Attire’s Travis Mattern for the outdoor enthusiast. The new pattern depicts a forest condition never before represented as a camouflage with a yellow and orange inferno engulfing the woods. Bold color and strong attitude make this pattern a noticeable lifestyle look. “About a year ago we released Moon Shine Attitude Attire’s Muddy Girl Camouflage™, Harvest Moon Camouflage® and Outshine Camouflage® with great success. Manufacturers and consumers are fond of Moon Shine’s patterns and clothing which have strong brand recognition,” Stated Mike Richards, Director of Business Development of TWN Industries. 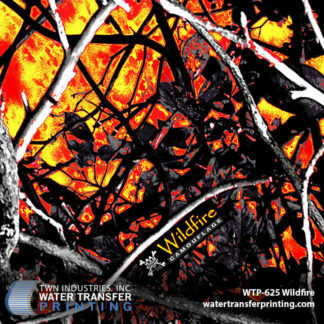 Wildfire Camouflage water transfer printing film is available exclusively through TWN Industries, Inc. Three meter accessory packs are available immediately. Part number for Wildfire is WTP-625. To find a TWN Certified Decorator to decorate products for you or to purchase film call 305-258-9622.